The “Russian spring” in the east is a revolution of paternalism. Its ideal, often unarticulated, is for a comprehensive, state-directed system of social organization that protects individuals from the risks of freedom. It reflects nostalgia for a time when the state assumed responsibility for all aspects of life, a time when the state was the society. It would be wrong to interpret this nostalgia as simply a desire to restore the old Soviet system. The neo-Soviet ideology is quite different from the old communist ideology that espoused an official atheism. The nostalgia for a safe, stable past borrows also from the now long-gone Russian imperial ideology. This article was originally published in First Things (October 2014). 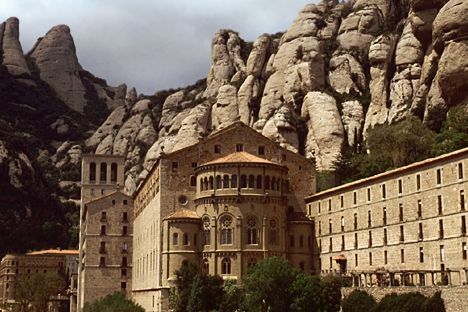 The Benedictines of Montserrat maintain a publishing house, A Publicacions de l’Abadia de Montserrat, dedicated to enhancing awareness and appreciation of Catalan culture. The publishing house boasts more than 3000 books in areas such as history, art, language, literature, religion, and music. In addition to monographs, the Abbey also publishes important periodicals. One of these is Qüestions de Vida Cristiana. Founded in 1958, it was the first periodical granted permission to print, despite a general prohibition on publications in the Catalan language. The journal never limited itself strictly to religious themes, but attempted to address topics of contemporary concern from the perspectives of theology, philosophy, literature, and so on. When, in 2013, supporters of Catalan independence formed a living chain 400 kilometers long along the Catalonian border (Via Catalana), the editors of the journal decided to devote their 247 issue (from 2014) to the question of Catalonian independence. Catalans today believe that the right to determine their destiny should be included among the list of human rights. College professors, theologians, politicians, sociologists, writers, and historians express their opinion on this question in the volume. This review considers contributions especially interesting from the point of view of the church and theology.